There’s no other way of putting it: I’m a trekking junkie. If you get excited at the sight of blue barrels or loaders or know the importance of carrying extra washers for the kerosene stoves, then you’re probably a trekking junkie too. If on the other hand, none of this makes any sense to you, and you’re off on a self-organized trek, then this page may be of some help to you. It takes years of experience before one can get apt at organizing a few tons of gear, to be carried by dozens of porters, for a few weeks on end. Out of our entire lot of mountain vagabonds, Atif Paracha knows more about organizing treks than the rest of us combined. 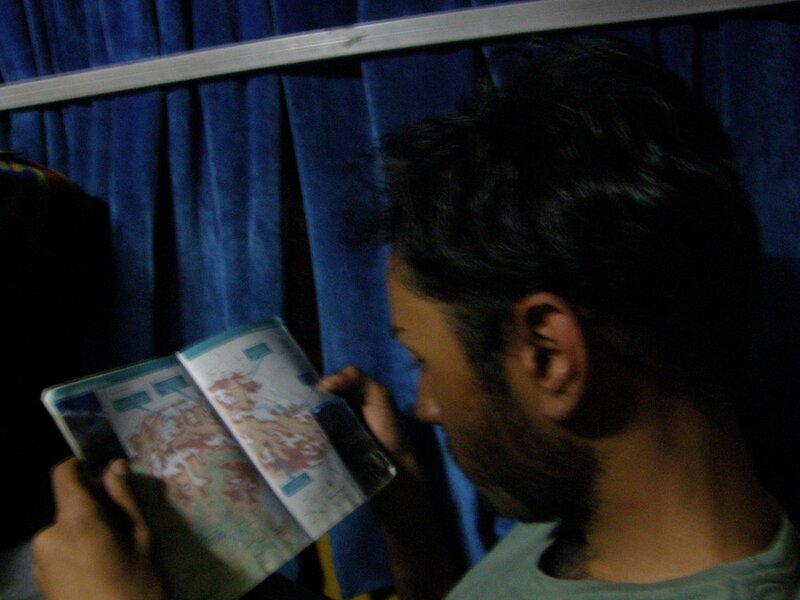 Hopefully, one of these days he’ll make good use of his expertise and write an essay for karakorams.com. Until then, use this essay as a starting point, ask for information from other travelers and make sure you have infinite patience and a great sense of humor. Most people end up doing the “big” treks in Baltistan with a travel company who will make all the arrangements for you. While organizing a trek yourself can seem like quite a chore, it is possible, and it can also be a lot of fun. Our Snow Lake traverse and trek up to Trippy 2001 (K2-Gondogoro La) Trek Page and back was organized by ourselves. We found that not only did we end up doing these treks on a shoestring budget, but that this also gave us a chance to work closely with locals making these treks an extremely rewarding experience. But organizing treks by yourself can be a challenge. This is the case if you don’t speak the language. Also, rules and regulations vary from region to region, so when in doubt double check with the Ministry of Tourism. Please remember to be extra-polite when dealing with locals. People in the Northern Areas have begun to resent the bossy attitude shown by certain foreigner and domestic tourists. On the whole, Baltis make honest employees, and porters do not hesitate to follow government regulations. For sight seeing around Baltistan, and suggestions on where to stay and eat, please refer to Skardu, Baltistan . Freelance guides abound in Baltistan and most of them know what they are doing. Expect to pay upwards of 500 rupees a day for a freelance guide. A cook is also a good idea if you are trekking in a big group. In a small group you can get by without one but cooking for anymore than a few people can be a pain. Your quality of life becomes much higher if you do not have to start tea yourself the moment you come into camp or wash dirty dishes in a cold mountain stream at night. In the summer months there is no shortage of cooks in Skardu, Baltistan . Expect to pay around 400 rupees for day. Balti porters put all other porters in the Northern Areas to shame. Simply put, they are honest, hard-working and highly professional folks. Most of them speak Urdu as well Balti and they love singing. The singing that you hear every night at the major campsites is not just a show put on for foreigners. When you trek you pay porters according to stages. A stage is supposed to be a days march but most people end up walking at least two stages over a six to eight hour day. The rate in Baltistan last year (2001) was 220 rupees per stage. In Baltistan, a porter carries 25 kilograms plus their own bedding. Until you are on a glacier, porters carry their own food (you pay them close to 50 rupees per porter/day – double check this amount). Once on a glacier you have to provide them with a fixed amount of food and fuel per day – the exact amount can be determined by looking at Ministry of Tourism guidelines. Porters are dismissed along the way as you consume your provisions. Porters who are dismissed and are returning empty get paid half wage for walking back. If you dismiss your porters at a trailhead you do not need to pay them half wages as they are not walking back empty. In addition you have to pay them approximately 200 rupees for personal equipment. Porters carry their own bedding and every eight porters is to be issued one tarp which they make into a makeshift shelter. Every ten porters or so is to be given one kerosene stove plus kerosene. If you’re organizing your own trip up the Trippy 2001 (K2-Gondogoro La) Trek Page or ,navigation id=”60″ title=”Biafo-Hispar”/> all this may end up getting very complicated. That’s why it helps to have a head porter, a porter sirdar. Ministry regulates that you need a sirdar for more than 25 porters. We recommend that you hire a sirdar even if you have less than 25. Finding the right sirdar is the key. Ask around in your hotel for recommendations. It is also a good idea to ask tour operators. It is essential to have a sirdar who has worked in this capacity before as it is the sirdar who will handle the porters for you. This includes hiring porters, dismissing them, and handing out food rations. In other words, the sirdar is your liaison between you and the porters. Feel free to ask for letters of recommendation though keep in mind that fewer sirdars and porters have these than you may imagine. It is a good idea to sit down with a sirdar before the trek and carefully go over every aspect of the trek. This includes the route of the journey, how many days you expect to be trekking for, how many porters you’ll need and how many supplies you’ll need to take with you. Be very clear about what you expect from the porters and be certain of what is expected of you. Put everything down on paper and both parties should sign it. Do not rely on a verbal contract. This avoids misunderstanding later on. Do make it a point to consult the latest Ministry regulations as rates fluctuate every year and porter regulations are considerably more complex than what we have dealt with here. 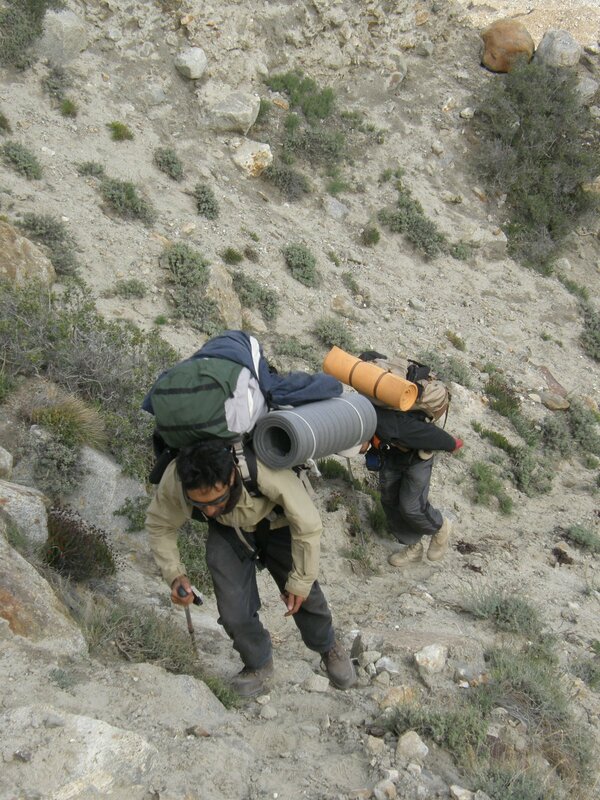 Certain trekking companies inflate rates and it is not unlikely that you may be asked for more wages along the way. We have found that these issues can be resolved with a little polite but firm negotiation especially if you have already clarified all aspects of the trek with your sirdar before. Avoid taking a “I am the law” stance and try to resolve the situation constructively. A tip at the end of the trek is expected. This is usually ten percent of what you have paid them. On the trek, make it a point to be extremely polite with your porters. In our experience with Balti porters, we have found them to be extremely helpful and sincere often going out of their way to help travelers. A smile, a handshake, and a “salaam” go a long way in creating bonds of camaraderie that lasts forever. Baltis take a great pride in Baltistan; if you find a particularly vista breathtaking them tell them that. It pleases them no end. Be generous with doling out medicine (bring lots of aspirin), cigarettes, or oral rehydration salts if you have extra. Remember that these are men who work extremely hard to eke out a living during the summer months that has to last them the entire year. When you are respectful of them and their culture, they shall reciprocate. This makes trekking a worthwhile experience that goes way beyond just admiring mountain scenery. We started out as backpackers, taking just the bare essentials, and carrying everything in a large backpack. As we started heading out on longer routes the logistics became increasingly complex. In the summer of 2000, I remembered looking at a hundred kilos of food that we were taking along for the Snow Lake traverse and groaning at the sheer quantity. Little did I know that the following year we would have more than one and half tons of food, fuel, and other equipment as headed up the Baltoro (ours was a “lightweight” trip up Biafo-Hispar. Between six trekkers we had four porters. Our Trippy 2001 (K2-Gondogoro La) Trek Page was also a minimalist one, where we started out with 43 porters per 24 trekkers. Unbelievable as it may sound, last year the trekker to porter ratio on the Baltoro was anywhere between 1:6 to 1:10). Food supplies are best procured in Lahore or ‘Pindi where you’ll get the best variety and best selection. Having said that, you’ll find pretty much everything you need in Skardu, Baltistan as well. This includes everything from canned fruit to imported chocolates and food, and less exotic items such as biscuits, jam and porridge. As mentioned above, you’ll need to provide food for the porters once you are on a glacier. Instead of trying to the math yourself of how much flour, and tea and sugar you’ll need, you can go to numerous shops in the town and ask for porter rations based on how many porters you’ll be employing for how many days. Many shops around Yadgar Chowk offer this service. Tarps and kerosene stoves are available between Yadgar and Husseini Chowk. Tarps cost about 800 rupees and a kerosene stove will set you back 500 to 800 depending on whether it has one or two burners. Double check that it works properly, and buy an extra washer or two and some basic tools for servicing. It may seem extravagant at the time but you do not want to be stuck halfway up with the Biafo with a stove that doesn’t work! Kerosene is readily available, as are large 25 liter jerry-cans. For transporting food, blue plastic barrels work best. These are cheaper in ‘Pindi. Expect to pay between 150 and 300 rupees per barrel depending on capacity and whether you buy them new or used. Some camping equipment is available in the bazaar as well, though of course, there is not much selection, nor is it particularly cheap. In a pinch, you should be able to buy sleeping bags, tents, and boots though these are best procured down-country. There is a limited amount of climbing hardware that is also available. This equipment is all used and of course, not recommended. Again, prices tend to be on the high side, and you would end up paying a lot for used for used equipment. Needless to say if you’re off climbing or if your going on a trek where you’ll need technical equipment, it is best to have all supplies with you prior to arrival in Baltistan. Do not count on finding camping gas either. While many stores now carry small camping gas cylinders, many of them have been refilled, and are not very reliable. Buying camping gas from a departing expedition is your best bet but there is no guarantee that you shall be able to find any. If your traveling with porters, your best bet is to simply buy a large kerosene stove. Porters and cooks are proficient are using these and making the necessary repairs. You’ll need to hire jeeps pretty much wherever you trek in Baltistan. There are two types of jeeps, the normal VIP ones that sit up to five people and luggage and the “loaders.” Loaders are cargo jeeps that are open at the back and can be pilled sky high with luggage and passengers. The two most popular destinations for trekking and climbing are Hushe and Askole. By the middle of the summer, there are roadblocks between Skurdu and Hushe and Skurdu and Askole. When you reach a roadblock you carry your luggage across and get in the next jeep (there are always jeeps in between the blocks). Expect to pay between 3,000 and 4,000 for jeeps to both these destinations. If the road is blocked, you do not pay each jeep driver separately. Rather, negotiate with the driver who will make arrangements all the way through. Numerous jeeps ply the road in Skurdu so ask for the best rates. We have taken jeeps from Shah Travel and from Rustom in the past and both have given us good service. Going on a long trek in Baltistan involves many logistical challenges, and compared to the simplicity of backpacking, the logistics are indeed daunting. Of course, if your traveling with a guide or a travel company then all these logistics are part of behind the scenes operations that you do not have to worry about. Doing it yourself, on the other hand, requires weeks and often times months of preparation. We’ve been trekking for a while and still learn something new every summer. Nobody knows it all and do not hesitate to ask for advice if you’re confused about something. Skurdu is teeming with guides, sirdars and experienced trekkers who are usually willing to help you out. When in doubt, double-check your information or the prices that are being quoted to you. Always maintain a sense of humor and have a high degree of patience. Try not to panic if you fall a day or two behind schedule or if unexpected costs come up (both the above will happen). The accompany photographs are from our 2001 trek up the Trippy 2001 (K2-Gondogoro La) Trek Page.